Asparagus is my favorite spring vegetable, and is just now coming into season here in San Diego. As a kid, however, I wouldn’t touch the stuff, so it was new to me when my mother served asparagus with toasted bread crumbs, a recipe she had learned from her mother. My husband Larry raved about it and, from that moment, he always asks for his asparagus “with crumbs”, just as my mom served us ages ago. On my own, I prefer to roast asparagus, drizzled with a little olive oil and sprinkled with sea salt. But when I served my grandma “Moo Moo’s” recipe, folks seem to enjoy it. And I think the buttery, toasted panko make the dish more substantial. This dish is so simple that it’s what I think of as “barely cooking”. These days, I tend to use the Japanese panko breadcrumbs, but any commercial, unseasoned breadcrumbs work well. TIP: When choosing fresh asparagus, the thicker spears are more flavorful than the pencil-sized bundles. Also, if you use walnut or grape seed oil instead of butter, I think this can be considered a vegan recipe, at least according to the ingredients in my panko breadcrumbs. My grandmother's recipe for asparagus, my favorite spring vegetable. Using a large skillet, fill with bottom ½-inch deep with water. Cover and bring to a boil. Add the asparagus, squeeze with the lemon, then add the squeezed fruit to the pan. Cover, lower heat to medium-low and cook until the asparagus is just fork tender, about 4-5 minutes. While the asparagus is cooking, melt the butter in a small skillet, then add the panko, salt and pepper. Cook, stirring, for about 3 minutes over medium-low heat. The panko browns quickly. 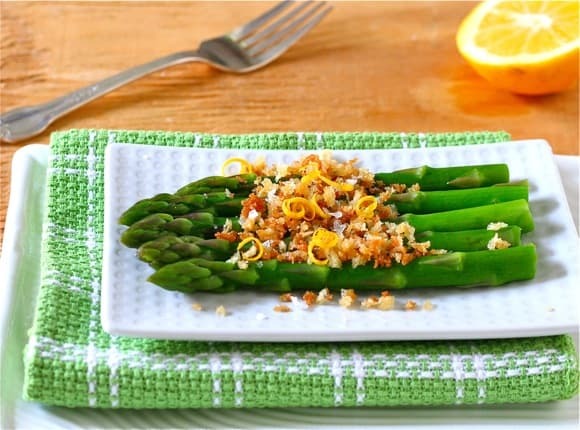 Serve the asparagus and top each serving with an equal amount of the toasted breadcrumbs. You have local asparagus already? You’re killing me, Liz. I’m not even dreaming of asparagus yet, but when I do, it will have your toasted panko on it. Just remember, I am an East Coast girl – and the snow storm approaches. Be safe. I love asparagus, and completely agree with everyone on the fatter ones. I can eat them raw, I love them so much. Love the simplicity of this dish – and my favorite way to enjoy asparagus 🙂 We’re back in snow country for the week, and had a little snow storm this morning. Yay! Oh I love this with the panko and lemon! Bring on the asparagus! This will be on our table many times this spring and summer – guaranteed. I am a roasting lover too but seems like this recipe would work fine either way. So easy-peasy, Beth – thanks. LOVE asparagus any which way! will try this later in the week. we’ve been having lots of it in lots of ways. and it makes me feel like spring really is on it’s way. Gorgeous photo! I love asparagus, although it will be a while before we get them here! Much easier to find the thicker stems so that’s great too! I just made this asparagus – so good! I used coconut oil for frying the crumbs and added a little garlic powder. They turned out delicious. Great for topping zucchini or fish too. I will be making this again. Thank you for the recipe!